Personalisation allows content publishers to create compelling, relevant online experiences that keep audiences on their owned channels for longer. Here I explore the key things to consider when developing your personalisation strategy. 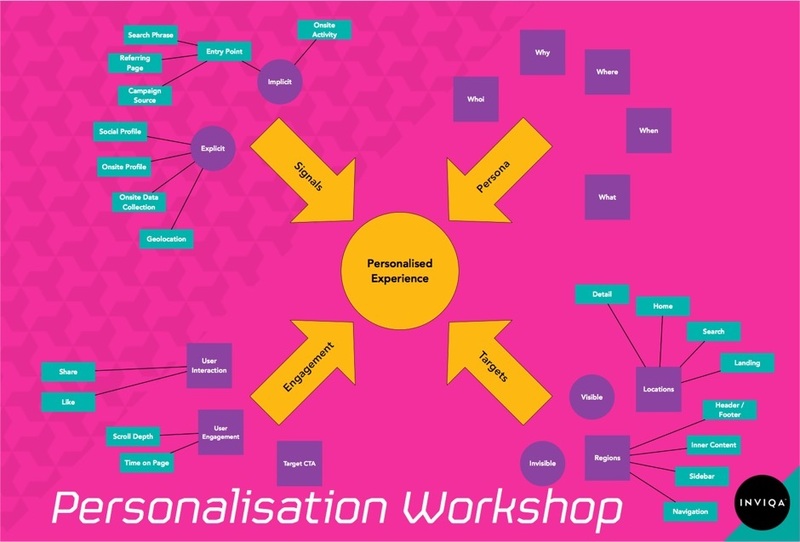 Whatever level of personalisation you want to bring to your website, it’s important to start with a personalisation model that will help you define your goals and understand the needs of your users. Any personalisation model will need to encompass the following key elements of the customer experience: signals, persona, targets, and engagement. Signals help you identify the personas that allow you to deliver personalised experiences across various targets and measure their impact. Your personalisation model will need to identify which signals you will use to define and enrich the user personas around which you’ll build your personalisation strategy. When considering personalisation scenarios, it’s vitally important to know who you’re talking to. You’ll already have personas shaped by your user experience measurement and analysis. But without context these personas are not going to give you enough fuel for your personalisation strategy. After all, acting on behavioural data is the foundation of personalisation. The following considerations will help you to establish behaviour-based segments and understand the customer journeys for each. The beauty of online is that you can tell what time a user engages with your content. Armed with this knowledge, you can dig deeper to understand how they’re behaving at different times of the day. For example, are some of your users commuters with an hour to spare for reading long-form content? Can you pick out users that are browsing on a tablet in front of the TV? Do you have an understanding of which users have a preference around reading short versus long-form content? Using a variety of techniques, you can determine with some accuracy where someone is in the world. This gives us more specifics for our persona and more signals to consider. You could use geolocation to deliver specific content, for example, be it on a country or hyper-local level. Additional signals, such as a switch of WiFi network, can help indicate when users are on the move. German app xMinutes, for example, has been developed with the express purpose of helping publishers to provide context-aware news based on a person’s movements. It analyses content in a structural way, looking at things like reading time and content type to determine the content that best matches a user’s behaviour, data and movements. Using past behaviour to predict a user’s intent, you can personalise their experience to help them towards their goal. In so doing, you look at what a user has done so far to anticipate the journey they’re on. Taking this further you can add more signals together to try and predict the user’s intent. For example, how did the user arrive on the site? Did they use a specific search phrase or arrive from a particular email campaign? This information – much of which you can find in Google Analytics – can clear the way to the user objective. Once we have this understanding of users and the signals they provide, we need to determine how to react to these signals and where we target our personalised experience – be that on the home page, search pages, call-to-action slots, and so on. Combining your behaviour-based segments and the user journeys associated with them, you’ll be able to create a breadth of ‘micro-segments’, which you can prioritise and use as the foundations of your personalisation strategy. Website personalisation can be achieved using varying levels of visibility with your users. Sometimes you’ll want it to be obvious for the user to see that content on a page has been personalised for them (for example if they are a paying subscriber to your content). In other cases, you might want those changes to be more subtle (for example if you’re compelling a user to become a paying subscriber). Views, or page impressions, has long been a metric we’ve used to measure success of a website. However changing user behaviour, such as tab abandonment, means this is no longer a particularly useful metric to measure whether your personalisation strategy is working. Instead you need to determine what you consider to be a good engagement score for your content. You can revert back to your signals again here to see what you can measure and how you can interpret this data – whether that’s through examining time on page, depth of scroll, interaction with features, or completion of call-to-actions. It would be remiss to talk about personalisation strategy without talking ethics. We’re all familiar with the filter bubble effect where websites (social media in particular) selectively serve us content that supports our ideological bubbles (and those of our friends and contacts). Being aware of this effect and its consequences is vital. A potential strategy for countering this might be to burst the filter bubble by deliberately exposing your users to counterpoint views with content that surprises or challenges them. There’s also an ethics question around the use of user data. Thanks to advancements in AI personalisation and machine learning, at Inviqa we’re developing the tools to adjust the presentation, delivery, and content itself based on what we think will resonate with different individuals. But getting here depends upon transparency. Brands need to be having conversations with their users about the level of personalisation they want to see, the amount and type of data they want to share, and the benefits they’ll see from parting with this information. Publishers are also having to contend with new breeds of devices capable of delivering our content. The likes of voice and Internet of Things (IoT) devices can’t read the type of content data we traditionally store in a content management system (CMS), so structured content is going to be key to delivering experiences tailored to the device and the user. Content modelling is key here, in helping you determine the relationships between your content, and helping you break that content into separate elements that can be used across devices. Content modelling lays the foundation of everything that comes next and should precede any technical decisions you make. Nathan Ansell, Director of Customer Loyalty for Marks & Spencer, will be speaking at this year’s Festival of Marketing. Ahead of the London event on 4/5 October (see the agenda and book tickets here), I caught up with Nathan to talk about M&S’s approach to data and customer loyalty. Here’s what he had to say.